From the A27 at Chichester, take the A286 south sign posted Witterings and Chichester Harbour water tours. Follow the road for 6 miles taking a right fork to West Wittering and (West) Itchenor (B2179) at the small roundabout just past the Total garage. Shortly after Russells Garden Centre, turn right onto Itchenor Road. Follow this pretty winding lane through the village of Itchenor down to the harbour. This quiet village offers the only 24 hour public launching site in the harbour and is where Itchenor Boat Hire operates from. 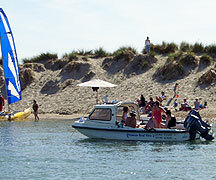 It is also home to Chichester Harbour Conservancy. Parking is available in the pay and display car park(PO20 7AE) signposted just before the Ship Inn, (£3.50 for the day, so bring change for the meter!). Meet your Itchenor Boat hire representative at the prearranged time by the public jetty just beyond the Harbour office. A seasonal ferry runs from Smugglers Hard, Bosham to Itchenor, Adult fare £1.75 each way. Itchenor Boat Hire clients use this ferry to get to and from your vessel which will be moored on a deep water mooring and pay £1.00 per person.